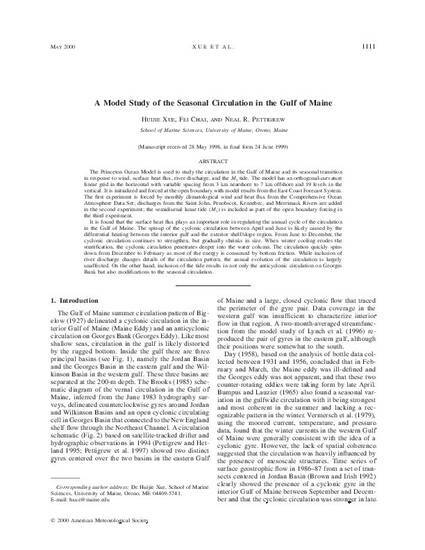 The Princeton Ocean Model is used to study the circulation in the Gulf of Maine and its seasonal transition in response to wind, surface heat flux, river discharge, and the M-2 tide. The model has an orthogonal-curvature linear grid in the horizontal with variable spacing from 3 km nearshore to 7 km offshore and 19 levels in the vertical. It is initialized and forced at the open boundary with model results from the East Coast Forecast System. The first experiment is forced by monthly climatological wind and heat flux from the Comprehensive Ocean Atmosphere Data Set; discharges from the Saint John, Penobscot, Kennebec, and Merrimack Rivers are added in the second experiment; the semidiurnal lunar tide (M-2) is included as part of the open boundary forcing in the third experiment. It is found that the surface heat flux plays an important role in regulating the annual cycle of the circulation in the Gulf of Maine. The spinup of the cyclonic circulation between April and June is likely caused by the differential heating between the interior gulf and the exterior shelf/slope region. From June to December the cyclonic circulation continues to strengthen, but gradually shrinks in size. When winter cooling erodes the stratification, the cyclonic circulation penetrates deeper into the water column. The circulation quickly spins down from December to February as most of the energy is consumed by bottom friction. While inclusion of river discharge changes details of the circulation pattern, the annual evolution of the circulation is largely unaffected. On the other hand, inclusion of the tide results in not only the anticyclonic circulation on Georges Bank but also modifications to the seasonal circulation.